Aloe melanacantha is not easily mistaken for another Aloe specie, the distinctive round shape of the rosettes, brown-green colour of the leaves and the black thorns on the leaf margins and keel help identify it. 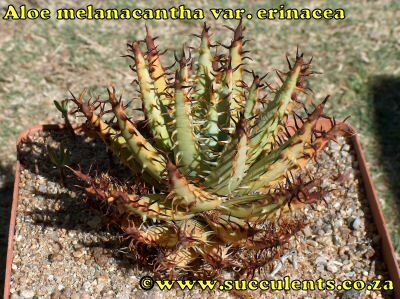 Another thorny specimen that used to be named Aloe erinacea has been included into the melanantha specie. It is now called Aloe melanantha var erinacae. 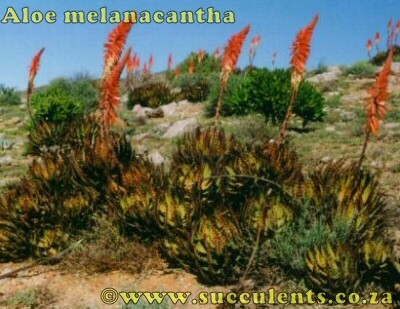 Aloe melanacantha received it's specie name from the colour of the thorns on its leaves. 'Melanacantha' means black thorns. Common Names: Kleinbergaalwyn (Small Mountain Aloe) and Goree. Distribution: Aloe melanacantha is found in very arid areas in rocky and sandy soils, between altitudes of 300 and 900 meters on slopes and hills. It is found from Bitterfontein to the Orange River and the southern regions of Namibia. Stem: Plants are stemless even in old specimens. plants may be solitary or form groups of up to 10 ball-shaped rosettes. Leaves: Leaves are 200mm in length and 40mm in width, narrow and triangular in shape, leaves are curved inwards which gives the plant its rounded shape. Leaf surfaces are rough and brown-green in colour. Sharp black thorns adorn the leaf margins and throns are present on the keel. Thorns are 10mm in length but tend to get smaller near the base becoming white in colour. Inflorescence: Simple inflorescence up to 1 meter in height, a single raceme up to 200mm in length and 80mm wide is present. Flower: Flowers are tubular in shape, flowers are red but gradually turn yellow after opening. Flowering Time: Flowering occurs in May and June. Notes: Aloe melanacantha is quite difficult to grow well out of habitat. Picture: Aloe melanacantha at Kosies in the Richtersveld.